Whether you need a formal Oriental rug appraisal, are looking for a rug appraiser / consultant or just find yourself wanting advice before making a purchasing decision, it is crucial to choose a rug appraiser / consultant you can trust. Barry is one of only 8 Senior Accredited Appraiser rug specialists in the U.S. accredited by the American Society of Appraisers. Barry’s reports are prepared confidentially in accordance with the Principles of Appraisal Practice and Code of Ethics as published by American Society of Appraisers. Reports conform to Uniform Standards of Professional Appraisal Practice [USPAP] as published by The Appraisal Foundation. Barry Amiri gives careful consideration to the purpose of your appraisal, as well as other factors that may be unique to your needs. 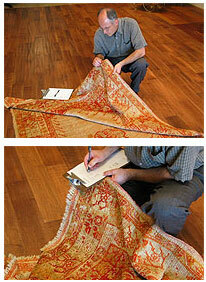 Contact Barry Amiri to assist you with your rug appraising and consulting needs.